During the Thanksgiving holidays I decided it was the perfect time to give up diet cokes. I did pretty well over the holiday, but upon returning to work, it has been tough. I am getting so little done during my planning period, and even if I get going in the afternoon, I feel as tho I am slugging through mud. I am not trying to avoid caffeine, but am concerned with the artificial ingredients in our foods. I have been moving toward eating more and more organic foods and fewer processed foods. I have never been a big processed food eater, but as a single person more of those type products have crept into my diet. It is just so easy for small amounts. When Will, my son, came for my birthday, he brought a 6 pack of unsweet tea for my lunch box. That has helped a bunch but I am still struggling. I think I am past the worst of it…I even took the 16 or so diet cokes I had here over to the school to put in the faculty refrigerator, for whom ever wants them. No change in weight or really how I feel, but I know it will be better for me. It is a bad time of year to be short of energy. But will continue to fight the good fight. 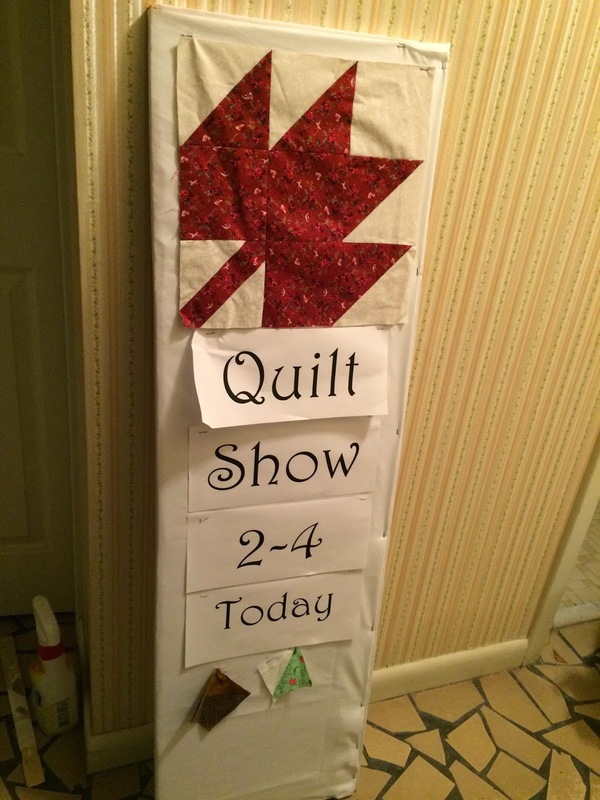 Saturday we had our annual Possum Town Quilters Christmas Party. 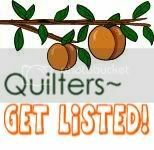 It is always a really nice party with fellowship with my quilting sisters. We do a pot luck, and play a couple of games and show any completed projects from that month. We exchange one small hand made object and one dirty santa gift. I had covered another board, like I did for my ironing table for my dirty santa gift and made a thread guide for my handmade gift exchange. To make the thread guide, used to hold large thread cones or any other thread option that won't fit on the machine I looked on line and found some samples. I came close to following this blogger's suggestion for making it. I made a few adjustments. I cut the board 4 x 4, just as she did. I also used a skewer like she did for the spool holder. I then spray painted it black. It took about 3 coats. The wood was a little rough on the bottom so I glued a piece of upholstery fabric to the bottom. I drilled a second hole in the base for the coat hanger wire I was using to guide the thread. I glued it in place and then twisted it just a little different front the blogger. 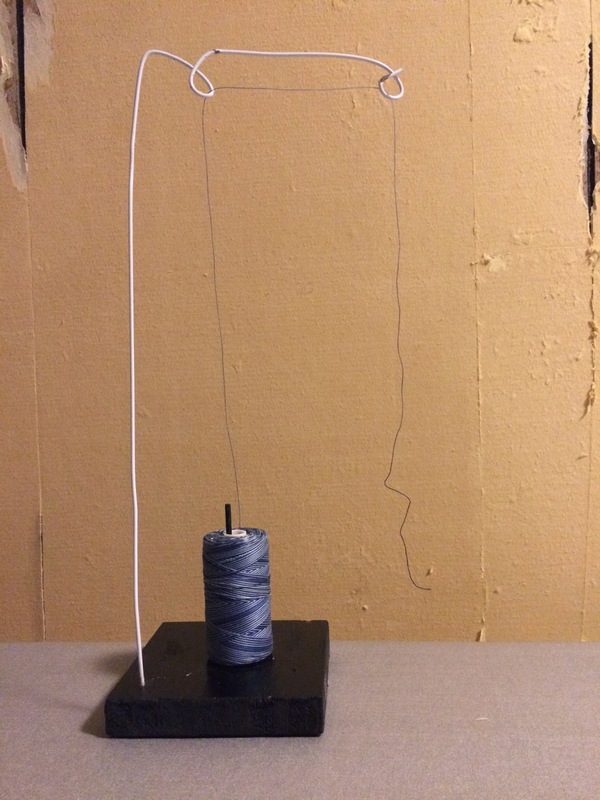 I put a loop right above the spool to make the thread come straight off the top and then a loop a couple of inches over that would be over the machine. Other than the time for the paint to dry between coats, it probably only takes about 20 minutes of work. On my way home from Columbus, it was nearing sunset. The sky reminded me of the of the skys in the mountains during Thanksgiving. The picture doesn't do God's handiwork justice...but it made me think of the mountains, which made me think of my girl and her friends. Good times. 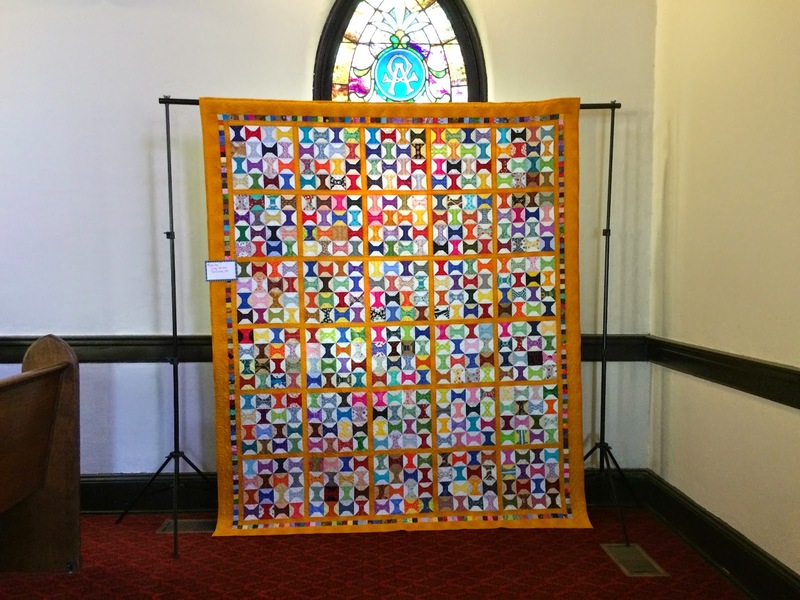 This is about 3 weeks late, but I wanted to show you some photos of the Winona Quilt Show that was on November 9, 2013. Lydia Chassinol, the state senator from Winona, wanted me to head up a quilt show in Winona as part of the heritage highway project. She has been promoting Highway 82 as a heritage highway. Cotesworth will be promoted as part of the heritage highway. I gathered up a number of quilts from my friends in Columbus. Special thanks to CC Coggins and Judy Stokes that were so generous with their quilts. 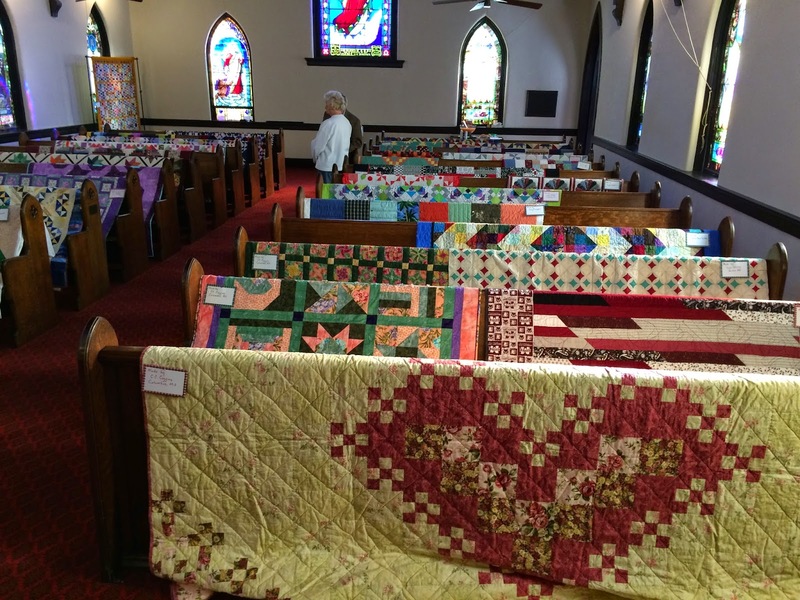 Lou Caffey of Winona also participated as several other Winona quilters and a few that showed antique family quilts. The show was pulled together in about 2 weeks. So there was not much time to promote it or get the word out. I woke up in the middle of the night before the show, and thought, we don't even have a sign to put out front to let the public know we are having a show. So I took the lower shelf off my planter table and covered it in white fabric and orphan quilt blocks and put it outside the church. Not great, but with short time frame, it will have to do. 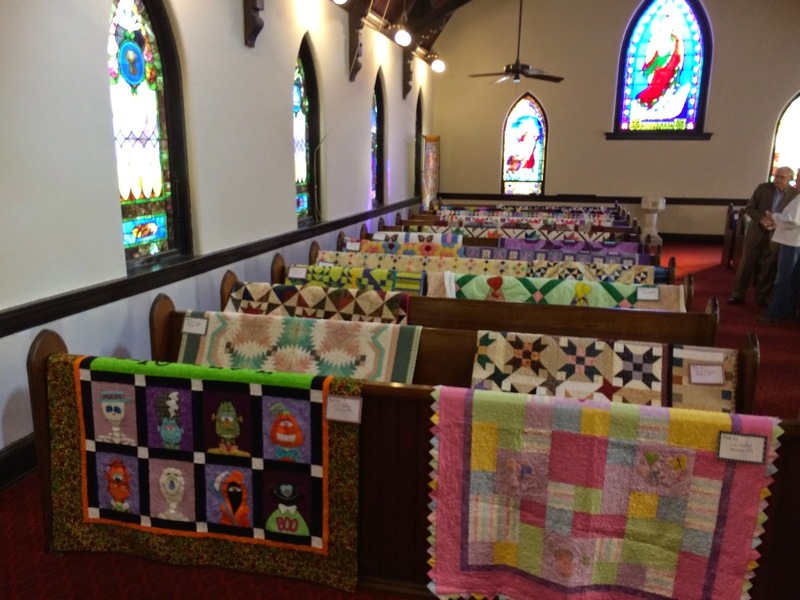 The quilt show was held at the Immanuel Episcopal Church on Summit Street in Winona. 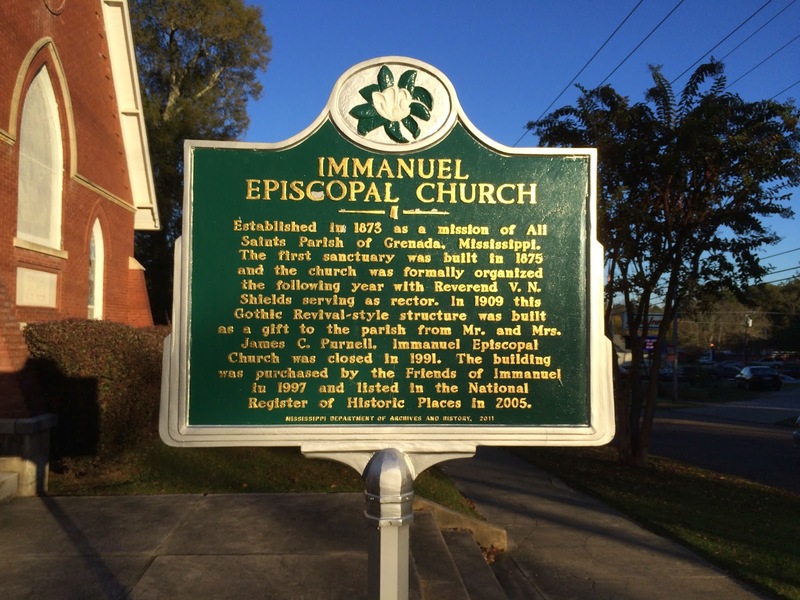 It is a beautiful church that was built around 1901 and the windows came out of an older church. 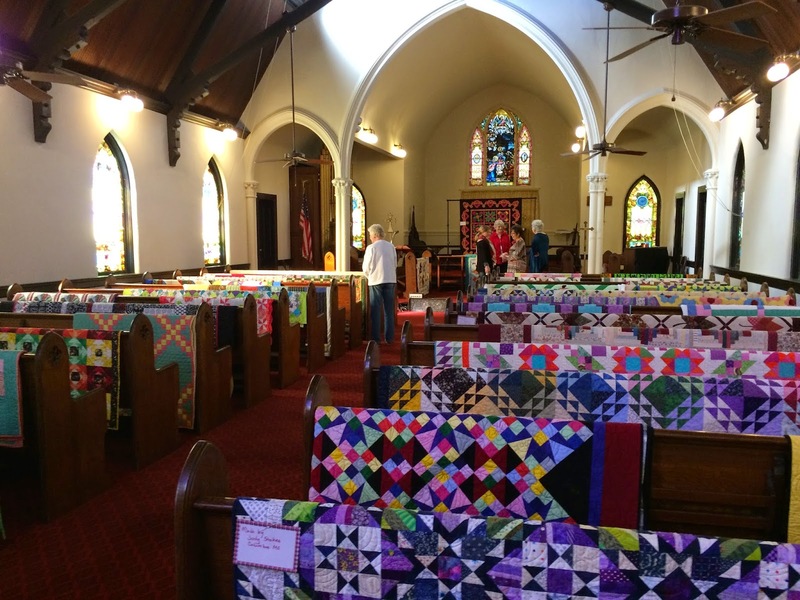 The plan was to hang the majority of the quilts on the pews and put a few on racks. The stained glassed windows in the church are really pretty. They remind me of the stained glass in First Baptist Columbus. The light coming through the glass was really pretty on the quilts. This is one of Judy Stokes quilts. It was a leader- ender project to make spools. She put her scrappy spools together in groups of 16 and sashed it. Fabulous. These are some of Lou Caffey's quilts. The one in the background won second in the Pinebelt quilters Show. Amazing work!! Hope it helps Lydia get her dream of having highway 82 a heritage highway.